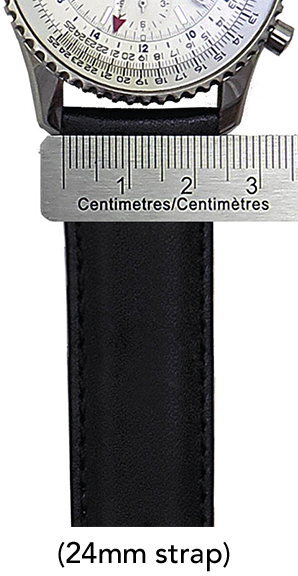 2 piece watch bands are measured by the width of the strap end that attaches to your watch. The strap width is always measured in millimeters (mm). Check the inside of your current strap to see if the size is clearly indicated. If the size is identified, and the strap fits well, you can simply purchase the same size. Measure the distance between the watch lugs in millimeters (mm). Make sure you measure from the inside of the lugs and shown in the example. It is better to measure the distance between the watch lugs then the actual strap width as this will give you a more precise measurement. If you have an average size wrist, it's likely safe to purchase a standard length strap that isn't described as being extra-long or extra short. 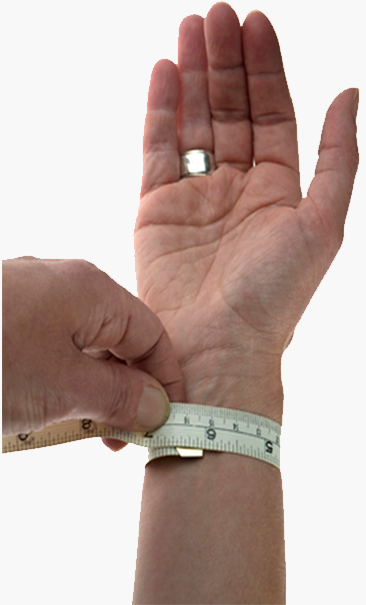 If you have a large or small size wrist, you may need to select an extra-long or extra short strap. Either way, taking a few minutes to identify the proper length can save you the disappointment of purchasing the wrong size. Measure the length of both straps together in millimeters (mm). You can also measure each one separately and add them up to get the total strap length. Do not include the buckle in your strap length measurement. If your current strap is a suitable length, you should purchase a strap of the same or similar length. If your current strap is too long or too short, then try to select a model that is longer or shorter. Strap lengths are always measured without the buckle. You can measure the length around your wrist using seamstress tape or the printable ruler provided in the link above. Keep in mind that you will need to factor in the width of your watch case when determining the total strap length needed. You should also remember that two piece straps can be adjusted smaller when buckled so it is okay if the strap length is somewhat longer than needed.